Frisco gets a third chance. For five sweltering days, the dog lay beside the road. People passed by, presuming him to be dead. Eventually someone stopped and found that the dog was alive, but barely. Three bullets had pierced his body and open sores riddled his skin. Luckily, he ended up at HART (Homeless Animal Rescue Team) in Cincinnati, who got him vet care and nurtured him through a long recovery. Six months after he was rescued, he was ready to be adopted. Two years later, HART received a devastating phone call. 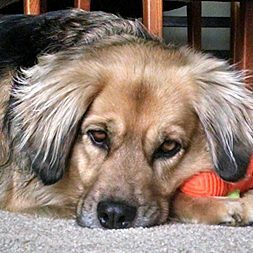 Frisco, as the dog was named, had been relinquished to another Ohio shelter; his microchip had led the staff to call HART. Their policy is to take back any pets when an adoption doesn’t work out, but obviously the adopters had ignored this. HART placed him back in foster care. But Frisco was about to get a third chance. About that same time, Jackie and Cheryl, who live in Kentucky, had lost their beloved 12-year-old dog, Gabe. While on vacation, they began looking at Petfinder and inquired about a dog they saw listed by HART. They met the rigorous requirements to adopt, but by then, that particular dog had found a home. So they relaxed and continued their vacation. 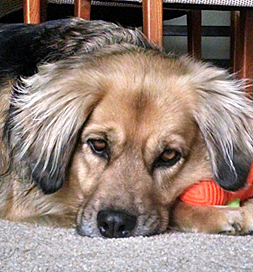 They couldn’t resist browsing on Petfinder, though, and happened upon Frisco’s sad saga. “He just literally jumped off the page into our hearts,” Jackie says. They contacted the shelter and begged them to keep Frisco until they returned a few days later. “We got home on Saturday night and met Frisco Sunday morning,” Jackie says, “and after spending about 30 minutes with him, we said, ‘Wrap him up!! '” Because of their earlier contact with HART, they were pre-approved to adopt. They awaken him. He is overjoyed to see them and kisses their faces, in gratitude, perhaps, for the loving home and caring family he now enjoys.